Who Painted the First Abstract Painting? : Wassily Kandinsky? Hilma af Klint? Or Another Contender? 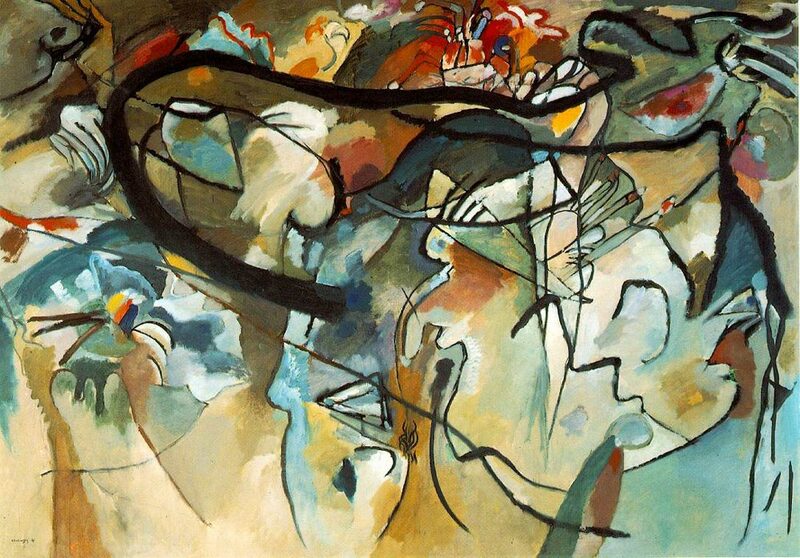 | Open Culture Who Painted the First Abstract Painting? : Wassily Kandinsky? 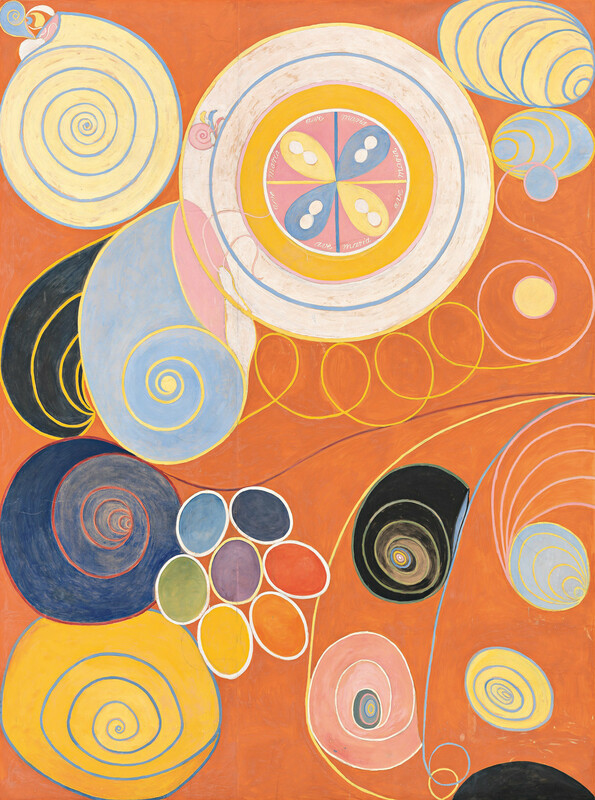 Hilma af Klint? Or Another Contender? Many painters today concentrate on producing abstract work — and a fair few of those have only ever produced abstract work. But look not so very far back in human history, and you'll find that to paint meant to paint representatively, to replicate on canvas the likenesses of the actual people, places, and things out there in the world. Humanity, of course didn't evolve with its representational art skills pre-installed: though some cave paintings do recognizably depict men and beasts, many strike us today as what we would call abstract, or at least abstracted. So which modern artists can lay claim to having rediscovered abstraction first? 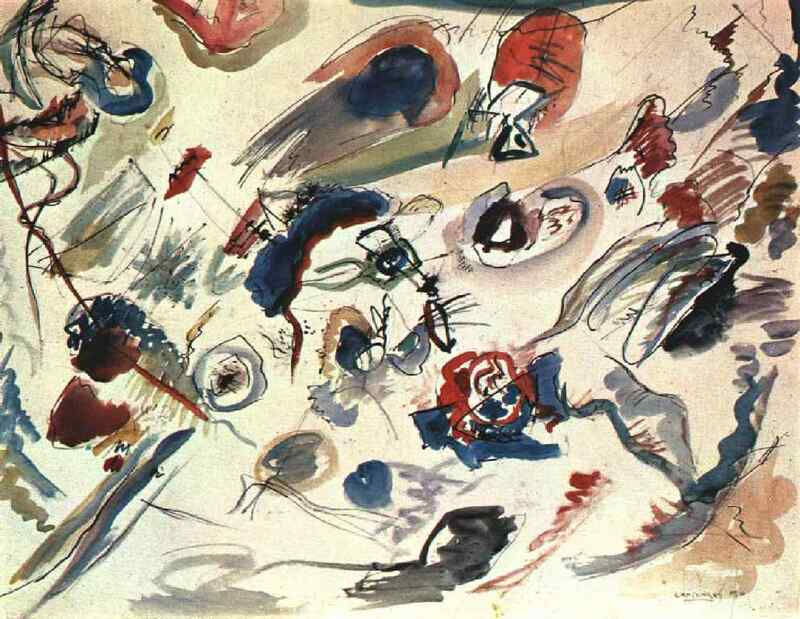 If you've studied any art history, you might well name the early 20th-century Russian painter Wassily Kandinsky (whose first abstract watercolor from 1910 appears at the top of the post). But "while Kandinsky is today hailed as the father of abstract painting," writes Artsy's Abigail Cain, "he was by no means the only player in the development of non-representational painting," though "his work Komposition V did, admittedly, jumpstart public interest in abstract painting." First exhibited in Munich in December 1911, "this monumental work was just barely representational" and also "the first such work to be put on display," inspiring the art world not just to take abstraction seriously but to see it as the future. Kandinsky, inspired by Goethe's Theory of Colors, had already given the subject of abstraction no small amount of thought. 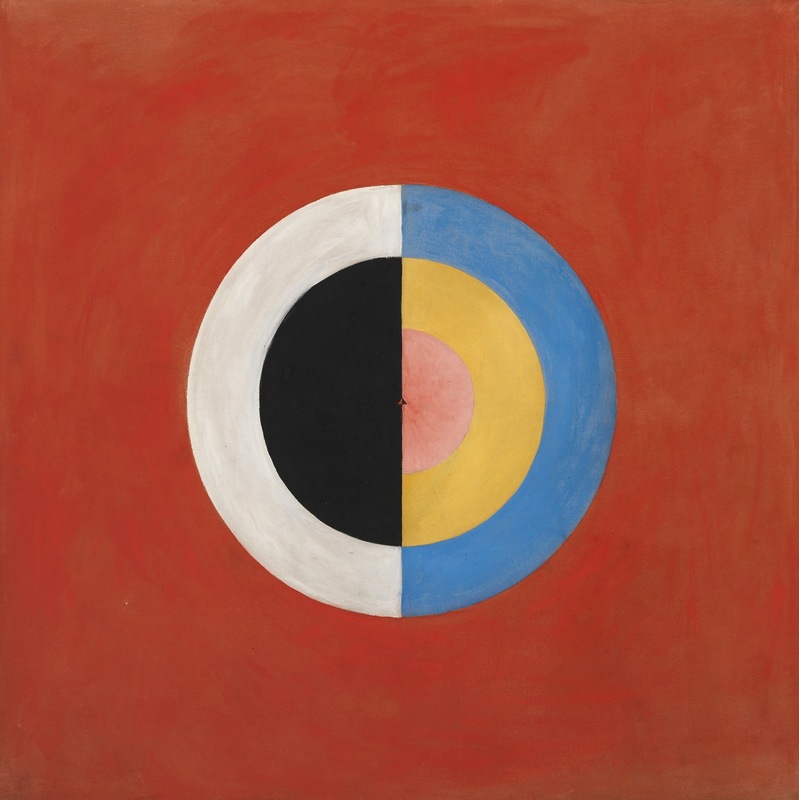 He'd first written a manifesto defining abstract art a few years earlier, titling it On the Spiritual in Art, a title that would have resonated with Hilma af Klint, a painter who might have actually gone abstract first. "Af Klint, who was born in Stockholm, showed an early interest in nature, mathematics and art, and she began studying at the Royal Swedish Academy of Fine Arts in 1882," writes the New York Times' Natalia Rachlin. She made her name as a landscape and portrait painter after graduation, but at the same time "also continued a more private pursuit: she had begun showing an interest in the occult and attending séances as early as 1879, at the age of 17." Hilma af Klint, ‘Staggering’: The Ten Largest, Youth, 1907. Af Klint's "curiosity about the spiritual realm soon developed into a lifelong interest in spiritism, theosophy and anthroposophy," and during one séance she heard a spirit tell her to "make paintings that would represent the immortal aspects of man. This proved to be the turning point in af Klint’s work: from the naturalistic to the abstract, from portrayals of physical reality to conveying the invisible." She went on to produce the 193 abstract Paintings for the Temple. The exhibitions of her representational work continued, but she kept the rest private, and in her will "even asked that her abstract paintings not be shown in public until at least twenty years after her death, noting that audiences were not yet capable of understanding her work." Both Kandinsky and Af Klint look like plausible candidates for the first abstract painter — it just depends on how you define the beginning of abstraction — but they're hardly the only ones. 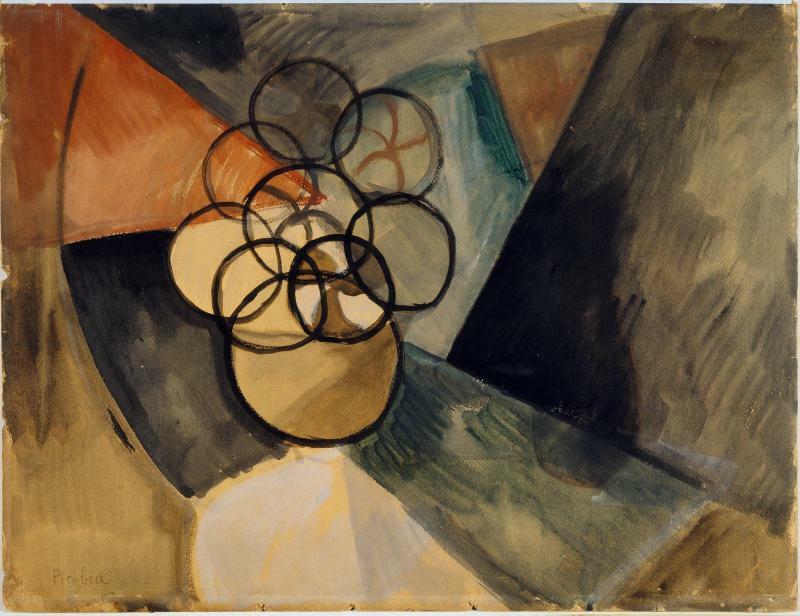 Cain also brings up the Czech-born, Paris-based artist František Kupka, or his colleague in the French avant-garde Francis Picabia, whose 1909 watercolor Caoutchouc (Rubber), pictured just above, came before Kandinsky had painted an abstract image or even completed any writing on the subject. Still, some objectors note that "the work still retains some semblance of form, reminiscent of a bouquet of flowers." These questions of purity, innovation, and especially originality do get complicated. As Clive James once said, "It's very hard to be totally inventive, so I'm not terribly interested in originality. Vitality is all I care about" — a quality that all these works exude still today. Me gusta el expresionismo abstracto, pero no puedo pensar en ello sin tener en cuenta a Jackson Pollock. Miro sus obras y nunca encuentro un final, siempre veo algo nuevo, quizás fue el tiempo que le tocó vivir. well, it seems you’ve limited the parameters of “who painted the first abstract painting” to western european artists of the 19th,20th century. If one would care to include Islamic art ….the parameters widen and the dates fly deep into the past….unless you disqualify Islamic art as abstract art.Do you? There are serious arguments put forth that Arthur Dove beat Kandinsky to it and painted the first completely abstract painting in Western art. If you look at Japanese paintings, Sesshu’s “Splashed-ink Landscape (破墨山水 Haboku sansui), 1495”, which was strongly aware of abstract expressions, so it will be the oldest. Also, the complete abstract painting will be Zen painting “square-triangle-circle” by Sengai Gibon (仙厓 義梵, 1750 – 1837). Much Islamic art is wonderful tessellation i.e. the repetition of geometrical forms on a surface to form a repeating pattern, which can be modified by the introduction of other geometrical forms at regular intervals. There are surviving examples of mosaic floors and walls with tessellation from the Roman empire. In the 1930s, the Dutch illusionist designer and painter, M.C. Escher, made tessellated paintings using repeating geometrical designs and creatures from nature. He was inspired by Moorish visual creations that he admired during a visit to the Alhambra in Spain. Definitely the abstract art is the representation of the feelings and the most internal form of communication that an artist has, it is not a matter of form or concrete, just the impulsivity of the moment, or I follow the painter Gabino Amaya Cacho, who paints dots of unmixed colors, in a clean and beautiful way. The date of Hilma af Klint’s work goes back as far as 1907. So if that date was mentioned (which in doing research for this article would be discovered) the answer to the question would with out a doubt be af Klint.